A natural tooth has two parts basically- a crown part and a root part. The crown part of the tooth can be seen above the gums whereas the root portion is surrounded by the jawbone and the gum layer. Root canal treatment is a specific filling method in which the roots of the teeth are filled prior to the upper part of the teeth. 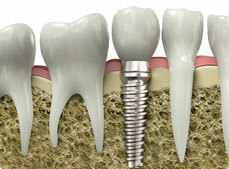 In a conventional filling only the crown part is cleaned and filled. This is why root canal treatment is a specialised form of treatment and is carried out in teeth that have exposed or infected or non-vital pulps. In plain terms, root canal treatment is the choice of treatment at Dental Care of Bryans Road in case of bad-aching teeth or teeth that are dead from within. Isolation of the tooth in question– Through a rubber dam, the tooth or teeth that have to undergo the treatment is isolated. This increases the focus of the dentist on the tooth as the rest of the mouth remains obscured from vision. Access to the root canals– The decayed portion is removed from the crown portion of the tooth and then the dentist skilfully gains access to the root canals. A good access increases the chances for a successful treatment. Cleaning of the root canals– Through this step the debris and the infected part stuck within the root canals is washed out. This step is quite critical as thoroughly cleaned and dried canals ensure that no irritant or source of infection is remaining within. Shaping of root canals– This procedure is intended to widen the root canals so that they are prepared to receive the filling material within. Filling of the root canals– Now the root canals are filled with a specialised filling material called gutta-percha. A tight seal is obtained through this filling and then the crown part is filled with a temporary filling material. After about a week or so the temporary filling material is converted to a permanent one. Now your tooth is ready for the placement of an artificial crown. You can expect some levels of tenderness after the completion of the root canal treatment. This is because the tissues around the tooth that were destroyed during the period of dental infection are taking time to heal. This can be managed effectively through painkillers and antibiotics prescribed by your dentist. On account of severe tenderness or swelling in the corresponding area or the occurrence of any other symptom that is strong and growing unbearable, immediate consultation is mandatory. Avoid chewing with the help of the root canal treated tooth until you receive a crown over it. Maintain good oral hygiene through routine brushing and flossing of your teeth. Avoid chewing hard objects on the treated tooth as that might aggravate your pain. Root canal treatment carried out at Dental Care at Bryans Road is offered at a price range of ….. We understand the requirements of our clients and strive to achieve high quality dental care at an affordable range. Actually, endodontic treatment turns out to be less expensive than tooth removal and replacement with an artificial tooth.